While there is currently no federal regulation requiring employers to provide paid sick leave, we are seeing a trend develop as more and more cities, counties and states are mandating it. Perhaps your own company provides paid sick leave, not because it is required to, but because you want to give your employees this benefit. It can be a valued perk that also provides peace of mind to your people when they must take time off from work due to illness or injury. Whether you do or you don’t offer paid sick leave today, you need to be aware that many cities and states are implementing regulations that require you to do so. In many cases, these regulations mandate specifics about what’s required of your company. To help you navigate the changing landscape, we’re sharing what we know so far. However, this isn’t legal advice – we’re HR experts, not legal professionals – so be sure to consult specific state and local sources or a trusted legal advisor to understand how you may be affected. What cities and states require paid sick leave? To follow is a current snapshot of some of the states and cities that have paid sick leave mandates. Given preliminary indications, this list will likely grow in the coming months as more hop aboard this bandwagon. Also of note, you’ll see that some cities are in states that already have paid sick leave laws. Like in the case of Illinois, the city laws may vary or be more stringent than state guidelines. 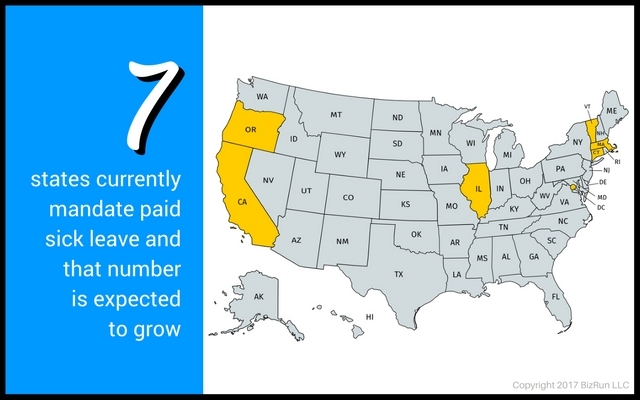 Illinois is one of the most recent states to regulate paid sick leave. Its Employee Sick Leave Act took effect January 1, 2017. This name is a bit misleading, because it doesn’t actually require employers to offer paid sick leave, but rather applies only to Illinois companies that already provide sick leave benefits. The act states that employees of Illinois companies who already receive sick leave benefits must be able to use these benefits for not only themselves, but for eligible family members, including the employee’s child, spouse, domestic partner, sibling, parent and others. It further states that employees be allowed to use paid sick leave for medical appointments and that employees be allowed to use their paid sick leave benefits without fear of retribution or negative consequences. Among the shortcomings of the Illinois’ policy, it does not define employee or employer. Leaving this to interpretation may lessen its enforceability as companies battle out the definition. It also doesn’t specify an accrual rate for paid sick leave benefits, which means every company can determine its own accrual rate. And it doesn’t specify whether the employer should require a doctor’s note for sick leave requests, a common requirement built into these types of policies. Other states, like California, do require employers to provide paid sick leave and include guidelines on the specifics. Likely in direct response to the gaps in Illinois’ Employee Sick Leave Act, both Cook County and Chicago have each developed its own policy for paid sick leave. The Chicago Paid Sick Leave Ordinance was enacted first, followed by the Cook County Earned Paid Sick Leave Ordinance, which largely applied the same policy countywide, with a few tweaks. Both take effect July 1, 2017. These regulations better define which employers are required to offer paid sick leave, as well as which employees are eligible for the benefit. If you employ even a single person in Cook County or Chicago, you may be affected. According to both ordinances, employees accrue one hour of sick leave for every 40 hours worked. There are no fractional accruals, only whole hours. Employees are allowed to carry over up to 20 hours of sick leave from one 12-month period to the next. If an employer already has a PTO policy in place that provides at least 40 hours of paid time off within a calendar year, they are not required to provide additional paid sick leave. However, if an employer is not currently offering paid sick leave, it is required to do so beginning in July. To get a better understanding of the Chicago, Cook County and Illinois paid sick leave laws, we created an easy-to-use comparison chart. You can get your own copy here. There are several other instances where cities and counties have passed their own paid sick leave ordinances, both in states with existing regulations and without. If your company operates in any of these areas, you should consult local experts or legal professionals to ensure you understand what’s expected of you as an employer. In Maine, lawmakers are currently discussing a proposed law called An Act to Support Healthy Workplaces and Healthy Families by Providing Paid Sick Leave to Certain Employees. The act, which is scheduled to be reviewed later in 2017, will provide one hour of sick leave to employees for every 30 hours worked. Employers with 50 or more employees would be required to provide paid sick leave, and those with fewer would be required to provide unpaid sick leave. Similar to Cook County, Maine’s proposed bill would cover not only care and treatment of health conditions, but also domestic abuse, sexual assault and stalking. Hawaii, too, is considering several sick leave bills currently. However, the state has a poor track record for getting laws about sick leave passed. And like in times past, there is opposition against the current proposed bills. Meanwhile in Minneapolis, a previously approved Sick Leave Ordinance may not be implemented in July 2017 as planned. In a lawsuit brought against the city, the Minnesota Chamber of Commerce, along with several businesses, argues that the ordinance goes beyond past state sick leave laws, and that it forces businesses outside of Minneapolis’ city limits to comply with the city ordinance. Only time will tell whether the ordinance gets implemented or not. Obviously, if you’re in an area with current paid sick leave legislation, you’ll want to ensure you’re in compliance by consulting a trusted expert. And if your state or city hasn’t yet implemented a required paid sick leave policy, there’s a good chance it will in the future. If you’re the type that likes to plan ahead, you may want to plan for that inevitability now to save you some headaches down the road. The easiest way to do this is to offer paid sick leave preemptively. Not only can it help you attract better talent in the hiring process, but it also shows your current employees that you care about their health and wellbeing, not just how they can help your business.